Grilled Chicken Caesar Salad | Relish! 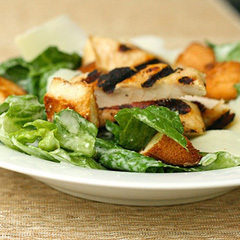 This delicious chicken Caesar salad can be thrown together easily on a work night. Preheat grill pan over medium heat until very hot, or heat the outdoor grill. Season the chicken with salt and pepper and drizzle with a little olive oil. Grill for 5 minutes, turn and grill another 5-7 minutes or until the center of the chicken is cooked through. Transfer the chicken to a cutting board and slice into strips crosswise. Place the lettuce in a large salad bowl and toss lightly with the dressing. Add the cheese and chicken, croutons and toss again.